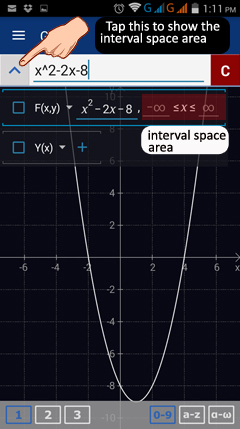 1) Tap the special points icon in the top right corner of the graphing window. 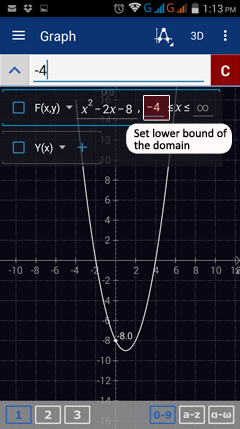 2) Tap set domain to enter an interval for the x- and y-axes. 3) Type the lower limits of the intervals in min X and min Y. Tap the number displayed on screen and change it to the desired number. 4) To set the upper limits, tap max X and max Y and change the number to your desired maximum. 5) To maintain these set intervals, you can check the Lock move and Lock zoom options below the Set domain options. 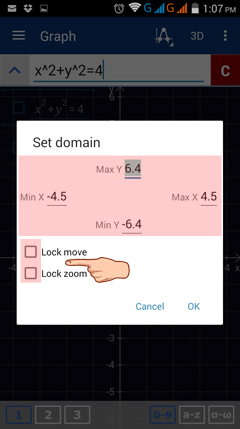 Uncheck these options to be able to move and zoom in and out of the graph. 1) Enter the equation of the function. 2) Tap the "arrow-up button" on the leftmost side of the input bar. 3) Note that the "arrow-up button" becomes an "arrow-down button" and the equation of the function appears directly below it. 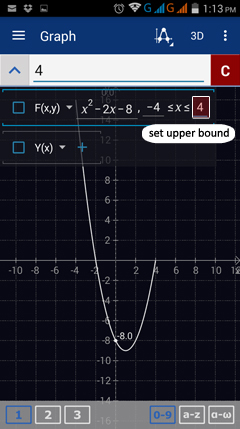 4) Tap the box on the left side of the equation to display the default interval "-∞ < x < +∞." 5) To set the lower bound of the domain, tap -∞ (negative infinity) and change it to the desired lower bound value. 6) To set the upper bound of the domain, tap +∞ (positive infinity) and change it to the desired upper bound value. 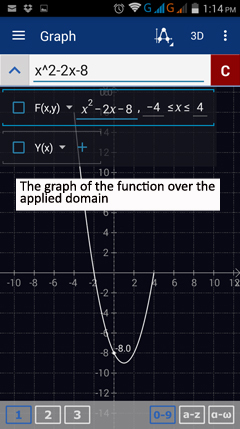 The graph of the function is automatically displayed over the applied domain.